As one of the grandest Victorian hotels in London, Hilton London Paddington is considered an engineering icon in the heart of the city. It is a stylish facility that is part of Paddington Station with four London Underground lines from the front door, which makes it one of the best-connected hotels in London. The hotel was built in 14 months, opening in 1854 as the Great Western Royal Hotel. It was first managed by its engineer, Isambard Kingdom Brunel, and by the 1930s, it was under control by the Great Western Railway. After a refurbishment in 2001, it was renamed Hilton London Paddington. The Hilton London Paddington offers 419 guestrooms and suites, with 54 in the exclusive GWR Tower Wing. The Art Deco rooms feature amenities such as televisions, desks, easy chairs, bathrobes, slippers, and exclusive bath toiletries. Enjoy a unique dining experience and craft cocktails at the 146 Paddington or The Brasserie. Hilton London Paddington is also the premier London location to hold conferences, galas, receptions, and weddings. With over 100,000 square feet of meeting space, the hotel can accommodate up to 350 guests. Those looking to stay fit can use the 24-hour fitness center with state-of-the-art equipment. Guests are encouraged to visit the concierge for assistance with tours and tickets. London is a rich, thriving city, where there is plenty to discover and explore. Visit Hyde Park, which was established in 1536 by Henry VIII and was opened to the public in 1637. Oxford Street is less than a mile from the hotel and is Europe's busiest shopping street, with around half a million daily visitors. Buckingham Palace is a 3.2 km walk through Hyde Park and is the official London residence for the Royal Family. This conveniently located hotel is connected roof-to-roof with the Heathrow Airport via the Heathrow Express (15 minute travel time). 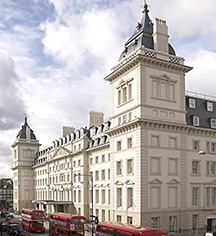 Hilton London Paddington, a member of Historic Hotels Worldwide since 2018, dates back to 1854. The hotel was inaugurated by Prince Albert in 1854 and is the first railway hotel in Britain. ATM: The nearest ATM is located in Paddington Station. Cancellation Policy: Cancellations must be made 24 hours prior. Early Check-In/Late Check-Out: Yes, depending on availability. Parking: Parking on-site is not available. As one of the grandest Victorian hotels in London, Hilton London Paddington is considered an engineering icon in the heart of the city. 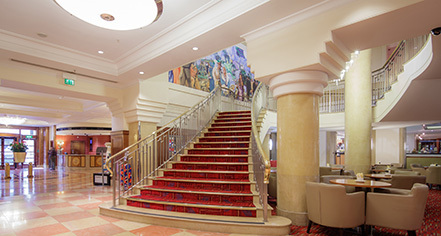 It is a stylish facility that is part of Paddington Station with four London Underground lines from the front door, which makes it one of the best-connected hotels in London. Learn more about the History of Hilton London Paddington .